USA captain Davis Love with the Ryder Cup. The Ryder Cup lived up to its billing - well in my house anyway - as the greatest sporting event on the planet. Reputations are made and dreams are crushed in a terrific atmosphere (if you disregard the unfunny comments, the ill-timed abuse and bizarre ‘cheeseburger’ comments from a few home fans). USA Ryder Cup star Patrick Reed. It was good to see the USA displaying European-style passion led by the brilliant Patrick Reed, the home side’s answer to Ian Poulter. 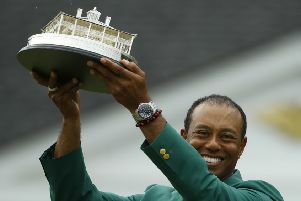 Europe’s bigger names failed to fire with the exception of the magnificent Rory McIlroy thus guaranteeing a rare defeat. It was also a shame to see a great Ryder Cup player like Lee Westwood finish his career in the event so poorly. USA captain Davis Love behaved with great dignity when he lost the ‘miracle at Medinah’ match four years ago so he deserves all the praise now that he’s tasted victory. Golfers are the greatest of all the sportsman and a few braying, boozed up fans should’t be allowed to tarnish a fine USA win.